Having undergone a comprehensive makeover, the popular Citroën DS3 recently made its UK debut in Cabriolet form. Featuring a cabrio roof, the new model offers an idyllic driving experience suited to the warmer months ahead, and we’d advise anyone with a taste for exhilarating open-top driving to give it a spin. The meticulous exterior design is striking at first glance, with a unique rear 3D LED light structure and a range of exterior colour schemes and wheel options. Motorists will be impressed by the compact frame and smooth bodylines, and the car’s ability to catch the sunlight perfectly – whether moving or stationary. Slip into the cabin and you’ll be particularly impressed, as comfortable soft touch surfaces allow all your passengers to relax. 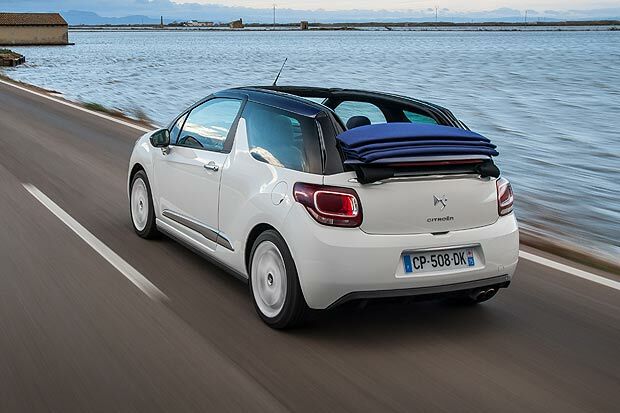 The DS3 Cabriolet is the only car of its class to seat five people, enabling you to take the whole family for a ride. It’s the cabrio roof, however, that impressed critics at the Paris Motor Show. The roof can be opened or closed in just 16 seconds, allowing you to make the most of the steadily improving weather, and there’s even a choice of three different sequential positions: intermediate, horizontal and fully open. To really appreciate open-top driving you need strong but stable performance, and the Citroën DS3 Cabriolet doesn’t shirk on power. Feel the wind across your face with the 1.6-litre THP 155bhp petrol engine, which pairs with a six-speed manual gearbox to offer 0-60 in 7.4 seconds. When you’re blazing down the highway with the roof down the last thing you want is to have to stop and refuel, so the DS3 Cabriolet’s superb fuel economy of 47.8mpg comes as a welcome relief. During an English summer it’s important to make the most of the sunlight – whenever it emerges. There’s no better way to do this than by enjoying an open-top cabriolet cruise, so get in touch with Toomey Citroën today to learn more about the new DS3 Cabriolet. Alternatively you can book a test drive in the new model at our dealership in Essex. ‹ Can I make my own biodiesel at home and is it safe?